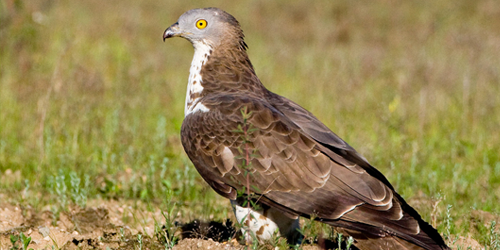 The honey buzzard is a bird of prey with a special diet: it is eating insects (mainly larvae of wasps and hornets). It is similar to the common buzzard, but it is a little bigger, with a length of 52–60-centimetre and with a 135–150 centimetre wingspan, but the head is smaller. The male has a blue-grey head, while the female’s head is brown. It is a summer migrant, wintering in tropical Africa. It generally prefers woodland, including the most undisturbed oak forests, with scattered pines. Many birds are shot on migration, notably in Italy, Malta and Lebanon. Other threats are deforestation, forest conversion and human disturbance. It is very highly vulnerable to the effects of potential wind energy development (IUCN, 2016). Locally, the deterioration of forests, the human disturbance during the leisure activities, the loss of prey caused by the agriculture pesticides (the forests are thin and surrounded by intensive agriculture) are the main threats to this species. Three or maybe four couples are nesting in the site IT4070011 Vena del Gesso Romagnola, in the areas of Carnè, Monte Mauro and Riva di San Biagio. In this areas we will maintain and improve forest structure and composition and we will plant hedges around the forests, increasing biodiversity and, therefore, the abundance of prey. We will in general cut the exotic pines plantations, but we will leave some old pines, suitable for the nesting of the honey buzzard and other birds of prey, such as the sparrowhawk and the short-toed eagle.